Indoor climbing is very popular but when you think about it, it is simply rock climbing performed indoors. Your main goal is to reach the top of the manufactured wall using ropes and with the help of a partner. On the other hand, bouldering is very different. Even though many people are unaware of the difference between the two, the truth is that they are quite easily distinguishable. Bouldering is the art of climbing without the use of protective gear. 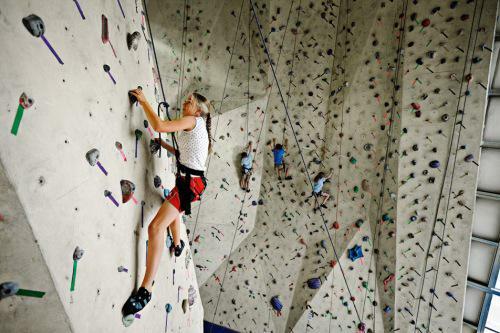 However, indoor bouldering is not like outdoor one – in indoor bouldering the walls are not more than a couple of feet tall and the main goal is to reach the top without falling down. It’s very complicated but with some practice you might be able to get used to it. The main advantage that many people love about bouldering is the freedom of movement that it provides. No kind of rock climbing, whether indoor or outdoor can provide you with such a great freedom. Furthermore, there is little to no equipment necessary if you want to go bouldering, and finally the biggest difference between it and climbing is that you don’t need a partner, nor a person to hold your ropes. Because of the great demand for this type of climbing, there have been many new walls built specifically for this purpose. There you can find a wide variety of inventive problems that you need to find a solution to if you want to reach the top, or rather the finish line, because it is not always located at the biggest height. You are required to move in a variety of angles, but you should not feel anxious because the floor is made with soft matting so that even if you fall down there will be no harm done. Even though most professionals initially used this only when they couldn’t go bouldering on the outside, it has since become a sports of its own and now many people choose to do only inside bouldering. One of the best things about indoor bouldering is the fact that the only real equipment that you need is going to be a pair of rock shoes, which can be found in any climbing centre where there is such wall. Still, if you would rather not wear shoes that other have worn before you, you are free to get your own pair from a store. Bouldering is great because it really helps build up your stamina. Bouldering is very engaging and sometimes it might require not only to be agile and tough, but also to be able to think on the spot, since the only way that you might proceed may not be so easy to spot. It can help you build both energy and mentality. When it comes to bouldering, you should always start from the beginning. Do not feel ashamed or embarrassed and keep in mind that even the best out there had to start from the basics. There is nothing shameful in needing help at the beginning, so don’t be afraid to ask. Focus on your technique and try to improve it every time that you are on the wall. You have to remember that strength is also important in bouldering but don’t rush it because it can be highly stressful on your body and you will get tired really fast. Keep in mind that in the end bouldering can be either done independently or socially. If you have a chance to go climbing with a couple of friends, don’t miss out. You are surely going to have a great time and feel good. On the other hand, you can go alone and really let some steam off with bouldering. Whatever way you choose, one thing is for certain – you will feel better at the end of the session. With the increasing growth of indoor centres around the United Kingdom, indoor bouldering is becoming more and more popular. You can now find one such near you that will offer a wide variety of great opportunities to climb on some great and reasonable prices. Whether you choose to go with friends or on your own, you can be sure that you are going to have a great time there. Next : What Are The Benefits Of Double Carport?